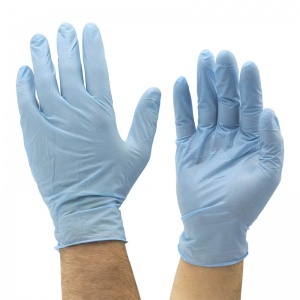 The Blue Mamba Disposable Nitrile Gloves BX-BLU are heavy duty nitrile gloves designed to be a seriously tough disposable glove that offers a great level of chemical protection, ideal for a range of different environments where standard nitrile gloves aren't enough. Made by the same people who brought you the class-leading Black Mamba gloves, the Blue Mamba gloves offer the same level of toughness and resistance but in a blue glove. 100 gloves are included in each box of the Blue Mamba Gloves. 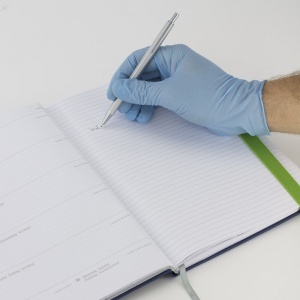 The blue colour of the Blue Mamba gloves makes it easier to see certain chemicals and solvents, helping you know if the glove is safe to continue using. This is vital in laboratories where chemicals can become contaminated, helping to to reduce this risk of tests failing. Made from a patented Nitrex Polymer with a thickness of nearly 6.0 mils the Blue Mamba gloves are incredibly tough, helping you keep your hands protected for longer. What's more, the gloves also feature two-ply Fusion Strength to provide even more durability ideal for a range of tasks. To give even more protection, the gloves also feature a 9.5 inch cuff, helping to keep wrists as protected as hands. The Blue Mamba gloves offer a high level of chemical resistance compared to latex gloves, giving you effective protection. The Blue Mamba Disposable Nitrile Gloves BX-BLU are available in three sizes designed to fit most individuals. Measure the width of your hand from one side of the palm to the other, excluding the thumb and fingers. These gloves meet my need to be resistant to automotive working, including exposure to degreasing agents. They are a vast improvement compared to latex gloves. I found that when latex gloves are exposed to such conditions, they fall to bits in a couple of minutes. I asked Safety Gloves for a more resilient product and they suggested these. One pair lasted the day and may have gone on longer with care.